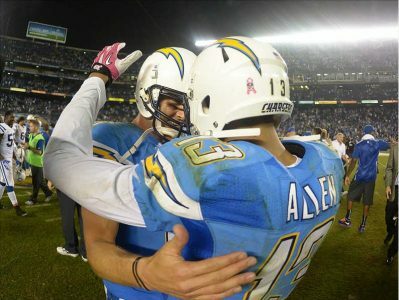 Play on: San Diego Chargers +4.5. We like to find teams that are playing 100% at this time of the campaign. For sure, the Chargers (8-5) are one of those units, but the heart breaking defeat vs. New England leaves us worrying about their emotional level vs. hard driving Denver (10-3). The line opened at -3-1/2 and has been driven up to -4 early on Monday. The Broncos have won three straight vs. Miami, Kansas City and Buffalo. Denver is in a little funk ATS going 1-3 coming into action vs. San Diego. Back in October Denver (-9) defeated the Chargers in Denver 35-21. But, San Diego has their last home game in the cue and would like nothing better than to disperse of the famed Peyton Manning and company. More importantly keeping their fading playoff hopes alive with just three games left vs. the aforementioned Broncos, Chiefs (A) and Niners (A) is of greater importance. Technically, we find support for San Diego in a Denver deficit as the Broncos visit knowing they are 10-21 ATS in road games vs. a unit carry a >.500 home mark. In addition, Denver is 1-6 ATS in Week #15 which is a solid indicator that they are playing with decreased emotion considering their winning record SU. Further, Denver is 5-11-2 ATS L18 battles with home standing Chargers. We close with San Diego 5-2 ATS in their last seven meeting against Denver…TAKE THE POINTS.